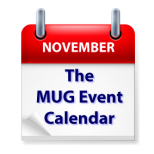 This week’s MUG Event Calendar features a number of notable speakers, including two appearances by Bob “Dr. Mac” LeVitus at New Jersey and Pennsylvania groups, Adam Engst‘s visit to a New York group, and Bryan Chaffin and Jeff Gamet talking tech at a Texas group. Cord Cutting is on the agenda at a Florida group, and Siri Shortcuts will be discussed at a Colorado group. Princeton Macintosh Users’ Group – Mac Author Bob “Dr. Mac” LeVitus returns! Southwest Florida Apple Knowledge Society – “Cutting the Cord” and streaming from your devices. MacGroup-Detroit – “What’s New with Apple” – new products, new operating systems.